The Ruger 10/22 is nowhere near being new to the market but has been a long time favorite of plinkers and small game hunters. 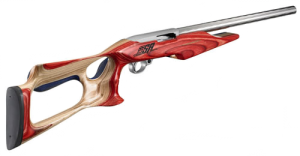 Introduced in 1964 the 10/22 features a rotary feed magazine, push button safety and an aluminum receiver. Over the years Ruger has produced quite a few variations of the 10/22. The current variations include carbine, compact, tactical, sporter and target styles. You can buy the 10/22 with an alloy steel or stainless steel barrels. Depending on which 10/22 you choose you have options on stocks, be it traditional hardwood, synthetic or laminated. I purchased my 10/22 Carbine used many years ago in a pawn shop for less than $100. It was one of the cleanest and smoothest operating guns I have ever seen pawned before, and it already had a scope mounted and sling added. Through the years I have put tens of thousands of rounds through my 10/22 with no major issues with the gun. The gun has never given me any mechanical failure and only one cosmetic issue. After several years of use (and many rounds) the barrel band cracked and eventually broke. The broken band only effected the cosmetics of the guns, it did not change the gun’s accuracy at all. There is only one thing that has ever bothered me about the Ruger and that was the stock magazine release. To release the magazine you would have to push the release button straight up leaving very little room to grab the magazine. Ruger has solved this problem with the newer versions by installing an extended release lever If you have an older version like myself you can install the Ruger lever or one from an aftermarket manufacturer. One of the nice things about the 10/22 is that you can get all sorts of accessories and aftermarket parts tailored to the fit. The only piece of the 10/22 I have not found in a catalog is the receiver alone. If you don’t like the stock look of the 10/22 it only takes a quick change of the stock to give it the M1 Carbine look. Maybe the Dragunov look? What about the look of the M4 complete with six position buttstock? If those don’t suit your fancy then you can try one of the many customized stocks available. You can easily order a complete trigger group complete with extended magazine release. You can even pick up one of several different barrels to improve your 10/22. The MSRP of the Ruger 10/22 starts at $277 up to $549. Online I found 10/22 rifles from $220 all the way up to $1200 for a fully customized. I would not hesitate to recommend the Ruger 10/22 for anybody no matter if they were using it primarily for plinking or for putting rabbit or other small game on the dinner table. It has proven to be a reliable rifle with the capability to consistently rip the bulls eye out of targets.